Pixelache compilation #1 explores the nature of a spectacle today. The non-stop stream of information known as ‘entertainment’ can no longer offer any true surprises for us. Instead, it engages us with a steady, hypnotic rhythm that allows us to fall into a passive dormant state, far away from the problems of the ‘real world’. This is not only true for the spectators, but also for the creators of this entertainment, whose are spending hours after hours in front of their computer workstation, fine-tuning the details of digital entertainment. Geert Mul (Netherlands), HeHe - Helen Evans & Heiko Hansen (France), JODI (eu/holland/belgium), Kristian Simolin (Finland), Liisa Lounila (Finland), Mike Nourse (US/Canada), Simon Faithfull (UK) and Steven Dixon & Tore Nilsson (Sweden). 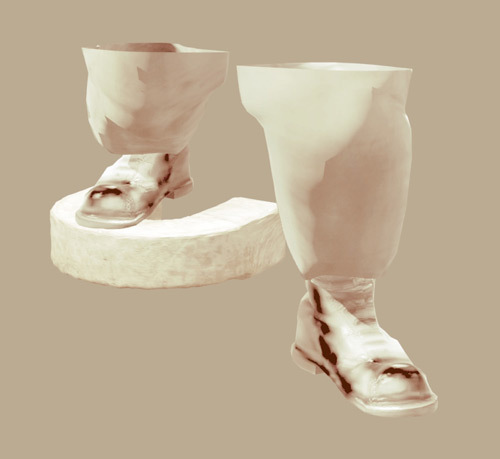 Many of the presented videos are only small fragments of work that has a longer duration and/or is normally presented as an installation/performance. Pixelache compilation #1 was premiered at Etoiles Polaires 07 festival in Vooruit, Ghent, Belgium in December 2007. The computer is connected to a satellite-dish. 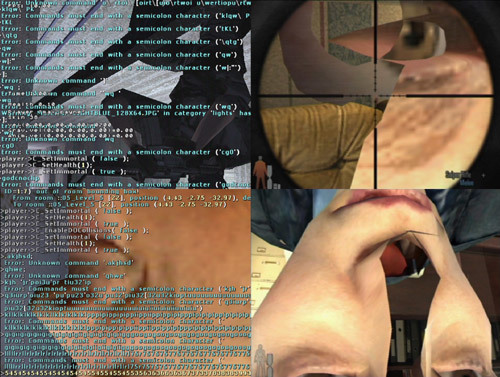 The computer is collecting television imagery that is sent out to the world from everywhere to everywhere. At random intervals it records clips from about thirty international satellite television channels. A software algorithm compares every image with every other single image stored in the computer, checking 5000 characteristics in each image. After 1000.000.000 comparisons, the computer generates a list. Images that share most of their characteristics appear in pairs on top of this list. This movie contains a selection of these clips. Geert Mul (b 1965) studied at the Academy of the Arts at Arnhem from 1985 until 1990 where he eventually specialized in computer animation. From 1990 till 1993 he travelled various countries such as Mexico and the USA and lived in Tokyo, Japan. The audio and video recordings made during these journeys were later exhibited in Dutch art spaces. To become financially independant, Mul, in the mid-90’s, started to create video screenings combined with pop music for a Rotterdam discotheque, which marks his first steps as a VJ. These events grew into interactive video and audio environments, in a variety of settings: museums, pop festivals, public space and concert halls. In his work Mul addresses the function of the space it will inhabit, varying from hectic discotheques, art-events, musea or public space. From 2000 on Mul made site-specific installations and artworks in Holland, the USA, Italy, Spain, India, Japan, China and South Africa. 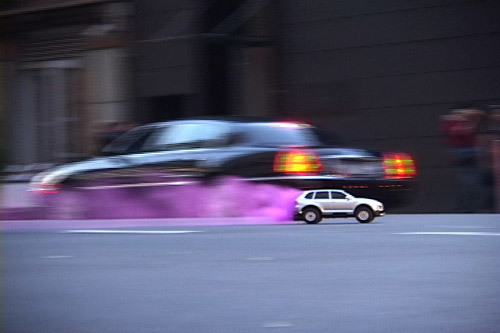 A car from a famous brand - and a greedy consumer of petrol - wanders through the streets of New York City, ejecting fumes in purple, yellow and white. The radio controlled car provokes it's larger rivals. It asks us to question the role of toys and how they represent a particular reality. HeHe (Helen Evans & Heiko Hansen) is a Paris based art and design partnership set up in 1999 by Helen Evans and Heiko Hansen. Using a language based on light, sound and image, their practice explores the relationship between the individual and their architectural and urban environment. Their propositions are utopian, often posing as products ready for consumption, but are also real, functioning temporarily at the moment of operation. Short excepts of 3 video installations by Kristian Simolin. The recent works of Kristian Simolin have been 3D-animations that feature characters engaged in arduous, monotonic work tasks. 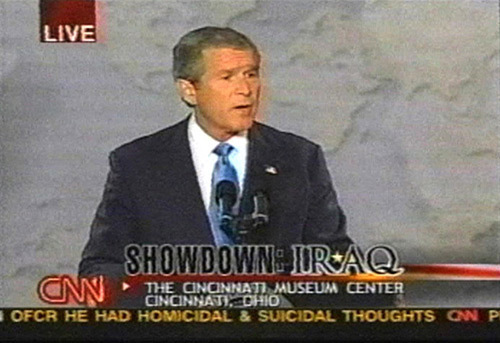 A remix of the televised 'State of the Union' speech by George W. Bush, given before US started its 'pre-emptive strike' against Iraq. Three specific topics are repeated very often in this speech. Mike Nourse is a Canadian artist, who has been working in video and design in Chicago for the last 10 years. Mike has worked with festivals as a contributor, panelist, and curator. His "media" videos have been shown around the world in festivals like Robert Flaherty Film Seminar (USA), Toronto International Media Art Biennial (Canada), Resfest (USA), Rapid Eye Festival (Holland), Ars Electronica (Austria), Impakt Festival (Netherlands), PixelACHE (Finland), and The San Francisco Independent Film Festival (USA). One computer selects two different tv channels every minute. It displays the picture from one channel and plays back the sound from another. 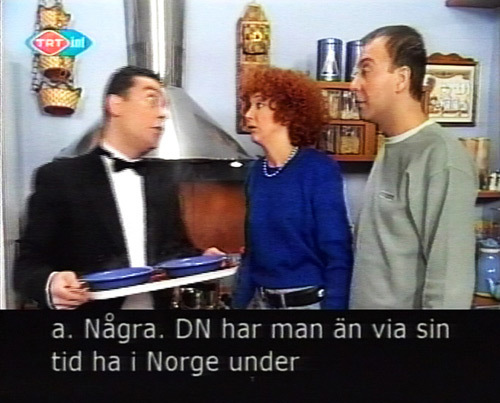 The computer is programmed to seek parameters of stations (sound vs. picture) from “similar” station programs (two sitcoms for instance) or “dissimilar” (cartoon with nature programs). Another computer analyses the sound coming in from the sound channel and attempts to type out what is being said, using a real-time speech recognition software. The resulting text is displayed at the bottom of the screen. Steven Dixon (born 1954, California, USA). Lives and works in Stockholm. After receiving his doctorate in philosophy, Steven Dixon began to work primarily in the visual arts as not only a teacher, lecturer, and writer, but also as an artist exploring the edges of media and ideology of art production. He is currently professor of art theory at the Art Academy in Bergen, Norway. The film is shot with a self-made pinhole camera, which exposes simultaneously 528 frames. When they are shown as a moving image they create a feeling of moving around a frozen subject. The time slice technique separates the movement and the time. In Flirt we see a fight. Liisa Lounila (b.1976) lives and works in Helsinki. Her main mediums are experimental film/video, photography and painting. Her works usually deal with an obscure need for change, great expectations and places of potential. Usually her pictures, both still and moving, have their background in movies, yellow papers, lifestyle magazines and pop lyrics. Escape Vehicle no.6 started as a live event developed from the previous balloon film 30km. The live audience first witnessed the launching of a weather balloon with a domestic chair dangling in space beneath it. Once the apparatus had dissapeared into the sky they then watched a live video relay from the weather balloon as it jouneyed from the ground to the edge of space (30km up). 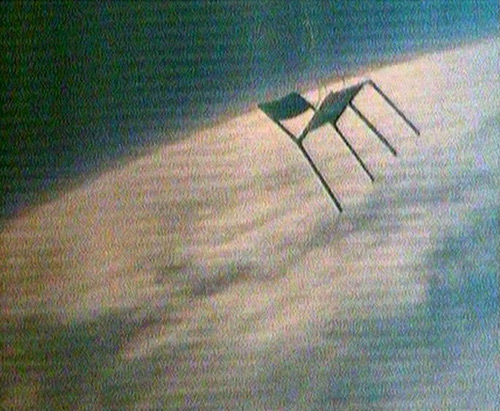 Now presented as a non-live video work, the footage shows the chair first rush away from the fields and roads, ascend through clouds and finally (against the curvature of the earth and the blackness of space) begin to disintegrate. The chilling nature of the film is that the empty chair invites the audience to imagine taking a journey to an uninhabitable realm where it is impossible to breath, the temperature is minus 60 below and the sky now resembles the blackness of space. Simon Faithfull was born in Ipsden, Oxfordshire and studied art at Central St Martins and then Reading University. His practice takes a variety of forms - ranging from video making, to digital drawing projects and installation work. The recent projects have included recording the journey of a domestic chair to the edge of space, sending back live digital drawings from a two month journey to Antarctica and creating an animated film from a mundane walk out of London along the A13 trunk road. These projects continue his exploration of both the extremities of the world and its relation to the everyday or mundane - typifying the two complementary, but almost opposite, sides to his practice.